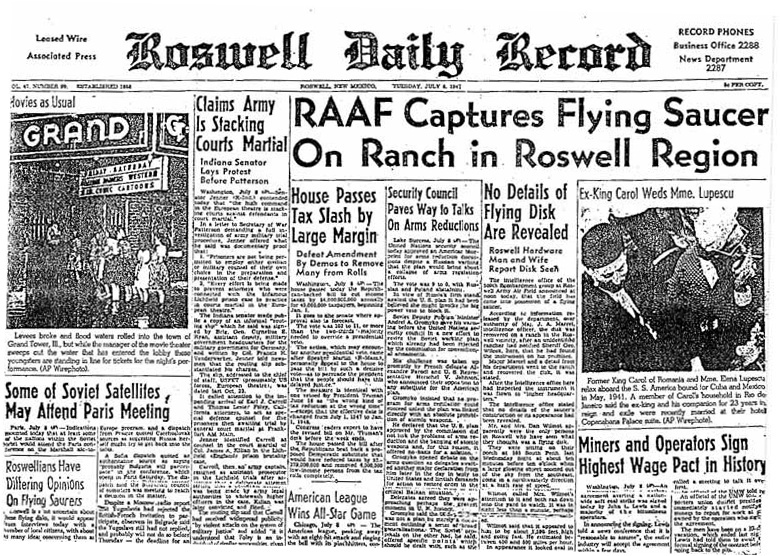 On June 24 of 1997 the U.S. Air Force actually released a report on the UFO that didn’t crash in Roswell, NM back in July 1947. It sounds utterly ridiculous. But then we live in enlightened times. Not like those superstitious chumps back in the Middle Ages who believed in God and thought the Earth was flat. Ha ha ha Looooosers. We read our horoscopes and are so sure aliens visit Earth and governments deny it that we make governments deny it again. It’s called progress. For the U.S. government to say it didn’t happen is just more modern idiocy since the conspiracy theorists know the government says it didn’t happen and has been saying so all along and they think it’s lying so they think it’s lying again. It doesn’t even rise to the “That just proves how clever they are” level because it’s too obvious; in a proper conspiracy the government would have had a panel of “independent” experts say it and too late you’d find they had cabbage leaves on the backs of their heads or something. Frankly if I was the U.S. Air Force I’d have told the UFO paranoids to go jump in a Martian canal. You can’t reason with these idiots and a less feeble age would have had the sense to say so. And then I’d have moved on to something more interesting. Like why we aren’t being visited by aliens. One possible reason is that because they became aware of us through early TV broadcasts they’ve been avoiding our planet on aesthetic and intellectual grounds. Grown-up aliens might lecture their green teen offspring “Don’t go to Earth; it rots your brain.” Or maybe the aliens came here to eat us but discovered we were unhealthy. The way we’re eating these days, if that is true we’re probably safe for a while. And I guess the government might not tell us because it was afraid we’d be offended. But speaking of broadcasting I Love Lucy to the cosmos and wondering why it never calls, the really interesting question is why it never calls. Visiting might be out of the question for all kinds of reasons including excess baggage fees. If aliens look anything like they often do in movies they’d need some kind of clothing and toiletries. Mind you, the ones in the Predator series didn’t seem to wear a lot of clothes but they had big intergalactic collections of trophy skulls to shlep around. But why don’t they call? Back in 1950 noted physicist Enrico Fermi, after discussing with colleagues the number of planets on which life could theoretically exist, the evolutionary processes that ought to have led to intelligent life (again, a category that at least sometimes involves humans, smart enough to invent television and dumb enough to watch sitcoms), and the enormous amount of time during which it could have happened multiple times, asked “Where is everybody?” Why aren’t we picking up their transmissions? The question has only become more pointed in the two-thirds of a century since. Apparently I Love Lucy has washed over some 6,000 star systems by now. Yet I Love Lxzygtq hasn’t been picked up coming back from any of them even though our radio telescopes stare beadily out in all directions. It’s not obvious what conclusions to draw from the apparent absence of technologically advanced alien civilizations. Maybe life is rarer than we think, even miraculous. Maybe man is alone in the universe. But whether it proves that there is a God and He goes in for elaborate stage settings, or that the universe is even colder and more hostile than anyone this side of H.P. Lovecraft believed, the central puzzle remains. Not why aliens crashed in Roswell. Why they didn’t, and why we haven’t picked up any radio chatter from anyone, even just a brief insulting travel advisory that Earth is “mostly harmless”.